Police in Linden, New Jersey, responded to a call from a bar owner about a man found sleeping in the hallway of the establishment. When an officer arrived, he recognized the man as Ahmad Khan Rahami, a 28-year-old United States citizen from Afghanistan, that the FBI sought to question in relation to the Chelsea bombing on Saturday. See photos from the scene near the bar in Linden on Sept. 19, after a shootout between the suspect and police that resulted in Rahami's arrest. Captain James Sarnicki of the Linden Police Department recounts events leading to the arrest of Ahmad Khan Rahami after a shootout, Monday, Sept. 19, 2016. 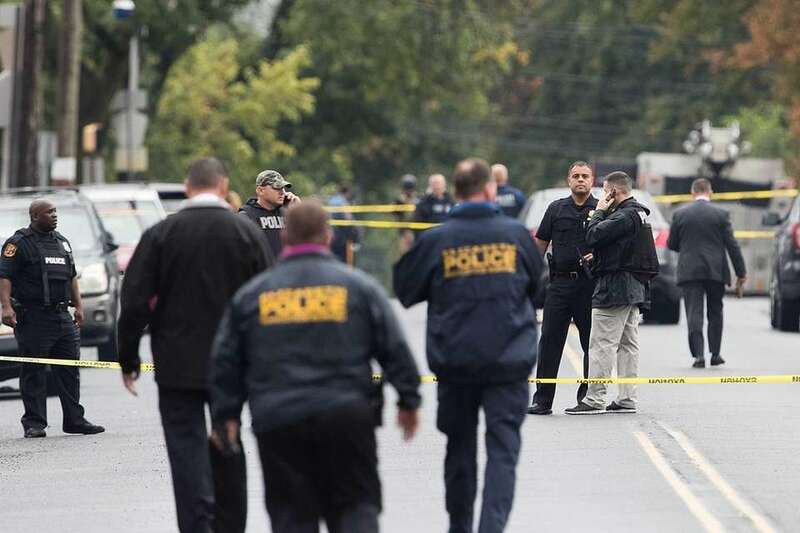 FBI and other law enforcement officers secure the area where terror suspect Ahmad Khan Rahami was arrested following a shootout in Linden, N.J., on Sept. 19, 2016. Rahami, 28, is wanted in connection with two separate explosions in Manhattan's Chelsea section and in Seaside Park, N.J., on Saturday, Sept. 17. Law enforcement officers secure the area where terror suspect Ahmad Khan Rahami was arrested following a shootout in Linden, N.J., on Sept. 19, 2016. Rahami, 28, is wanted in connection with two separate explosions in Manhattan's Chelsea section and in Seaside Park, N.J., on Saturday, Sept. 17. Law enforcement officials secure the site where terror suspect Ahmad Khan Rahami was arrested after a shootout with police in Linden, N.J., on Sept. 19, 2016. Rahami, 28, is wanted in connection with two separate explosions in Manhattan's Chelsea section and in Seaside Park, N.J., on Saturday, Sept. 17. Law enforcement officials secure the site where terror suspect Ahmad Khan Rahami was arrested after a shootout with police in Linden, N.J., on Sept. 19, 2016. Law enforcement officials gather at the site where terror suspect Ahmad Khan Rahami was arrested after a shootout with police in Linden, N.J., on Sept. 19, 2016. Rahami, 28, is wanted in connection with two separate explosions in Manhattan's Chelsea section and in Seaside Park, N.J., on Saturday, Sept. 17. Feds charge Rahami with bombing a public placeRahami was also charged for the use of weapons of mass destruction. Criminal complaint reveals new details about bombing suspectRahami is portrayed as a jihadist in the federal criminal complaint. See photos from the scene of Chelsea explosionThe blast happened at 23rd Street between Sixth and Seventh avenues.